Manuel Gonzales is the winner of the American Library Assocation’s Alex Award, and the author of the acclaimed story collection The Miniature Wife, winner of the American Academy of Arts and Letters Sue Kaufman Prize for First Fiction and the John Gardner Fiction Book Award. A graduate of the Columbia University Creative Writing Program, he teaches writing at the University of Kentucky and the Institute of American Indian Arts. He has published fiction and nonfiction in Open City, Fence, One Story, Esquire, McSweeney’s Quarterly Concern, and The Believer. Gonzales lives in Kentucky with his wife and two children. CLICK HERE FOR MORE BOOKS BY MANUEL GONZALES. 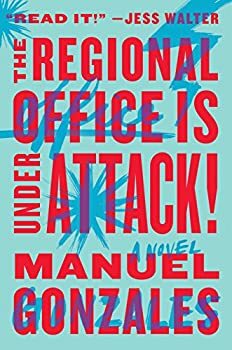 As I kept reading The Regional Office is Under Attack (2016) by Manuel Gonzales, whipsawing back and forth between being impressed and being annoyed, I found myself pulling for Gonzales to pull it off, and it was a near thing. In the end, I think I come down on the side of the novel frustrating somewhat more than it delights, though it leaves me intrigued to see what Gonzales comes up with next. Uniquely positioned to Empower and Strengthen otherwise troubled or at-risk Young Women to act as a Barrier of last resort between the survival of the Planet and the amassing Forces of Darkness that Threaten, at nearly every turn, to Destroy it.